We have reached the state semifinals in the 11-Man classes of Kansas high school football, and the 8-Man state championship games will be played this Saturday in Newton. Kpreps will continue to post state rankings throughout the playoffs culminating in our final poll after the state champions are crowned. Let’s take a look at the Kpreps.com rankings for November 14th. Check out our complete Rankings for further details. The final four is set in Class 6A where top-ranked Derby will host No. 4 Lawrence Free State and No. 2 Blue Valley will host No. 3 Shawnee Mission East. Derby used a big first quarter to take control in a 40-7 win over Hutchinson. Meanwhile, Free State advanced thanks to a 40-yard field goal by sophomore Kameron Lake to defeat Washburn Rural, 17-14. The Free State defense held Rural to 68 yards of total offense and zero points. Washburn Rural’s points came on a punt return for a touchdown and a pick-six. Blue Valley scored a couple of touchdowns late in the third quarter to pull away from Blue Valley North. The Tigers defeated the Mustangs for the second time this season. Shawnee Mission East eliminated Shawnee Mission North 41-25 for their second win over the Indians this year. Shawnee Mission North quarterback Will Schneider passed for 253 yards in the game and pushed his career total to a new state record of 8,901 career passing yards. Schneider broke the previous career mark of 8,781 yards by Silver Lake’s Kyle Kruger from 2000-2003. In Class 5A, No. 1 Great Bend rallied from a 24-14 deficit in the fourth quarter to top Valley Center, 28-24. The Panthers will host No. 2 Goddard in the 5A semifinals next week. Goddard knocked out Wichita Heights 28-14 behind a strong defensive effort in the second half. Third-ranked St. Thomas Aquinas rolled to a 57-21 win at Topeka Seaman. The Saints will host No. 4 and defending-champion Mill Valley in the other semifinal. Aquinas defeated Mill Valley 40-33 earlier this season. In Class 4A, Division I, one semifinal will feature No. 1 Bishop Miege hosting No. 2 Basehor-Linwood. The Stags led 22-6 at halftime, but pulled away from Louisburg for a 49-6 win. Meanwhile, Basehor-Linwood won 48-14 at Ottawa. The other semifinal features No. 3 Buhler traveling to No. 4 Maize South. Buhler defeated Maize South 21-14 back in Week 4. 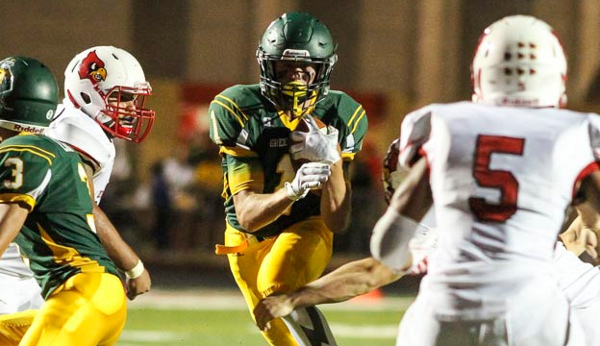 There are plenty of changes in the 4A-II poll this week. Holton enters the rankings at No. 4 after the Wildcats pulled off a substantial fourth-quarter rally to eliminate No. 1 Frontenac. Frontenac led 21-0 entering the fourth quarter, but a pair of Raider miscues led to Holton touchdowns. Frontenac would retake the lead 28-24 mid-way through the fourth quarter, but Holton went on a 21-play drive that ended with a Wildcat touchdown with 13 seconds remaining to pull off the win. Holton will host No. 3 Topeka Hayden this week in the east semifinal. Pratt is the new No. 1 team in 4A-II. The Greenbacks will travel to defending champion No. 2 Holcomb in the other 4A-II semifinal. The Class 3A final four is set as No. 2 Nemaha Central will travel to third-ranked and two-time defending-champion Rossville. The West semifinal will feature top-ranked Hoisington going on the road to take on fellow Central Kansas League member No. 4 Hesston. In Class 2-1A, the top three teams remains the same this week while St. Mary’s Colgan and Washington County trade places in the No. 4 and No. 5 spot. Colgan defeated Washington County 29-20 on Friday. The Panthers will travel to No. 1 Troy in one semifinal, while No. 2 Plainville will host No. 3 Smith Center in the other semifinal game. The state championship games are set in both eight-man classes and will take place on Saturday at Fischer Field in Newton. The Division I game features St. Francis against No. 2 Osborne. Saint Francis advanced to the first state title game in school history by knocking out defending champion Spearville, 36-30. The Indians are back in the top spot in the 8M-I poll where they spent most of the regular season. Osborne advanced to the title game with a 62-16 trouncing of Burlingame. The Bulldogs are back at Newton for the first time since 2013 when they defeated Hodgeman County 56-8 to win the title. In Division II, Hanover’s defense shut out Pike Valley on Friday for a 48-0 win. The top-ranked Wildcats are back in an 8-Man title game for the third consecutive season having lost in the Division I game to Central Plains in 2014 and Spearville last season. Hanover will face unbeated Dighton which advanced to the title game by holding off Sharon Springs-Wallace County 40-32. The Hornets built a 34-0 lead and led 40-16 before Wallace County scored a pair of touchdowns in the final two minutes.